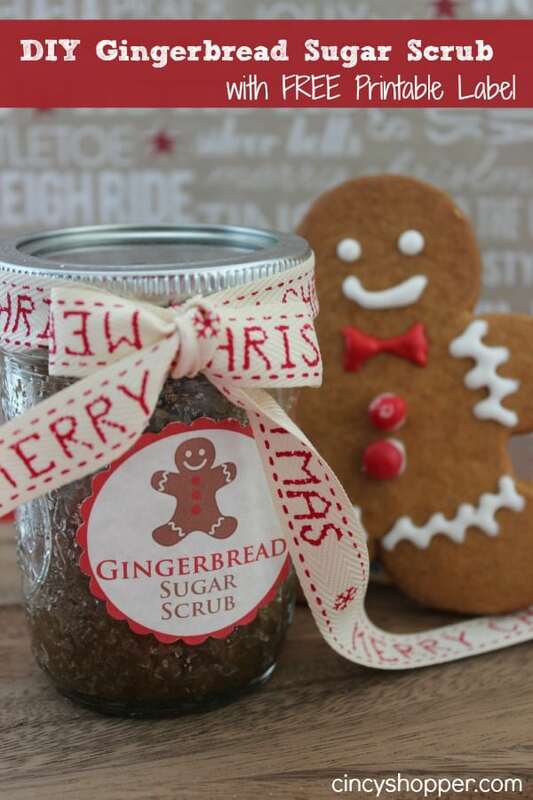 Time for a DIY Gingerbread Scrub in a Jar Gift with FREE Printable Label. I have quite a few DIY gift ideas that I still have to share with all of you. I am always running last minute during the holidays, ha ha. Do you run late too? 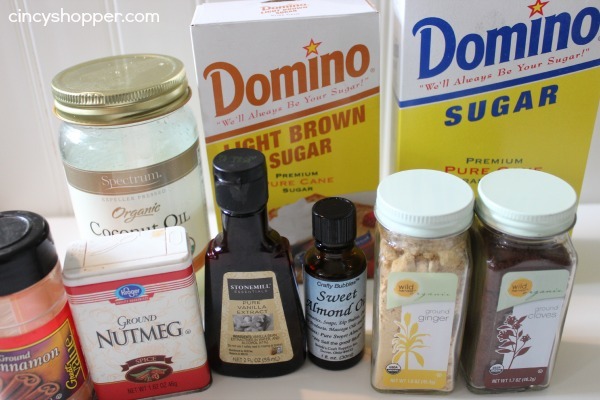 I have been sharing so many scrub recipes with all of you. 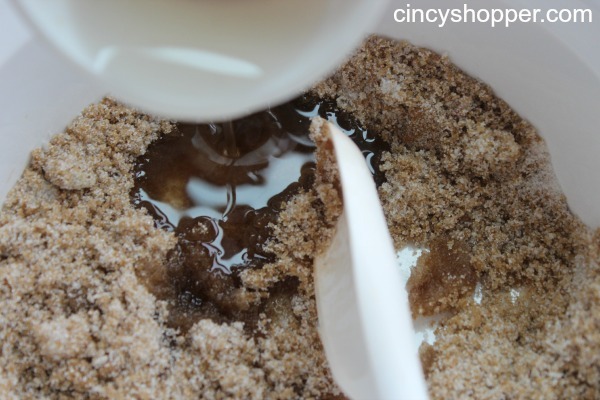 This DIY Gingerbread scrub is perfect for many on your holiday lists. I made this recipe for quite a few of my relatives as it was one of my favorites. After the holiday I am going to make sure I make one for myself. Gingerbread are so whimsical and just plain cute! This scrub recipe is quite simple made with many of the items you will find in your spice cabinet. Just toss all your ingredients in a bowl and then into a mason jar or other container and you will have a nice gift. I really liked adding the ribbon and the printable label that my hubby made up for these gifts. The extras made it look quite unique. In a medium sized bowl combine all ingredients except the Coconut Oil. Gradually add Coconut Oil (add additional oil if you like your scrub in a very wet consistency). Add Label to front of Jar and a ribbon if gifting. 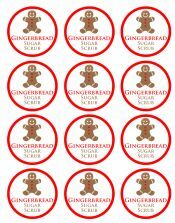 You can print the FREE Gingerbread Sugar Scrub Label Here. If you are needing other DIY Gift Ideas be sure to drop by Cincyshopper each and everyday for my 25 Days of DIY Gifts Series. I have already shared DIY Coffee Scrub, DIY Peppermint Scrub, Lavender Body Butter, Lemon Sugar Scrub, Sugar Cookie Scrub, Cranberry White Chocolate Oatmeal Cookie Mix in a Jar Gift a White Chocolate Covered Pretzels Jar Gift, a Salted Caramel DIY Gift, a DIY Pork Rub in a Jar for the Men, A DIY CopyCat Montgomery Inn BBQ Sauce for the Men, Rudolph Hot Chocolates, DIY Christmas Play Dough for the kiddos, Hershey’s Kiss Jar Gift , Rudolph 6 Rootbeer 6 Pack for just about anyone (we are giving them for teacher gifts). I will be offering up some ideas for DIY Gifts for everyone on your shopping lists. you can check out all my ideas so far here. Also, be sure to follow my DIY Gifts Board on Pinterest! What size jar does this recipe fill? Thanks!